d3.js is from Mike Bostok's site. If you use any of this material, please be sure to maintain the acknowledgement for his work. 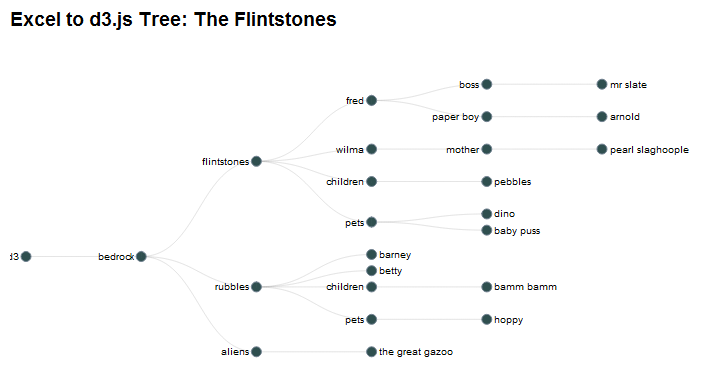 I also found out how to create tree diagrams on Pavan Podila's blog. And for those with capability challenged browsers (IE mainly), here's a screenshot. a Key - this is a unique key that identifies each row. 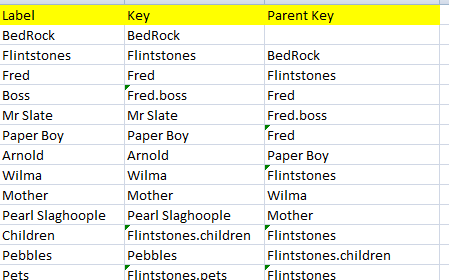 a Parent Key - this refers to the unique key that is the parent of this row. The depth and complexity of the tree is up to you - as long as you define the keys uniquely. To create a d3 Tree diagram, you simply need to construct a table as above. If your want to automate creating data in this format, take a look at an easy way to transform it in this post. Most of this you wont need to touch, but you can tweak the style (these are css style definitions) and header parameters to affect the layout and content of the final web page. The options tweak the tree layout, and I will add some more at some point. It is also possible to change the operation of the chart if you are comfortable with d3.js - you can find this in the code parameter. The generated filename is set with the htmlName parameter. Some directories on your machine may be readonly to you - for example if you have downloaded this and run it from the download directory on windows 8 you may not be able to create a file in that directory because of local permission settings. You should set this to a directory you have permission to create files in. This is a single file with no dependencies (except to the d3.js library) and you can put it on a web site or mail it to someone as you wish. Note that IE8 and below may not work with d3.js. Chrome is best and Firefox works too. All code is implemented in the cDataSet.xlsm download. dsParam.populateData wholeSheet(params), , , True, "item"
dsOptions.populateData wholeSheet(params), , , True, "options"
"<script> var mcpherTreeData = " & Mid(js, 2, Len(js) - 2) & ";</script></head><body><div>"
' does parent key exist? Why not join our forum,follow the blog or follow me on twitter to ensure you get updates when they are available. You can find out more about other d3.js visualizations from Excel here.